Perhaps the phrase ‘don’t believe the hype’ is unfortunately all too relevant for the supposed ‘horror’ anthology series. The latest promotional image for Ryan Murphy’s thriller anthology ‘American Horror Story’ is pure gothic perfection. A glossy demon baby drenched in a blood-red wash, with an elongated satanic claw cradling it dearly. It’s an image straight from my nightmares/dreams as well as drawing on traditional horror archetypes. Melding the gothic with utter eeriness, it’s a formula that has succeeded in creating hype for the anticipated ninth season, revealed as ‘American Horror Story: Apocalypse’. I already know I’m going to be disappointed. Obviously this isn’t the first occasion American Horror Story’s outstanding creative efforts sprouting from promotional posters, teaser trailers, or sneak peeks have gotten my hopes up so very high, only to be massively brought down within viewing 30 minutes of the first episode. After the success of premiere season “Murder House” and its successor “Asylum”, the series garnered questionable popularity with Wiccan inspired, women-centric ‘Coven’. The following seasons ‘Freakshow’, ‘Hotel’, ‘Roanoke’ (honestly, who watched that?) and ‘Cult’, a Trump-inspired series (never the best idea) were, to be frank, immensely un-scary, un-inspired and lazy attempts that were contrived in their concepts and execution. Bitterly disappointed, I told myself never to be enticed by the spectacularly spooky teasers, until this morning. 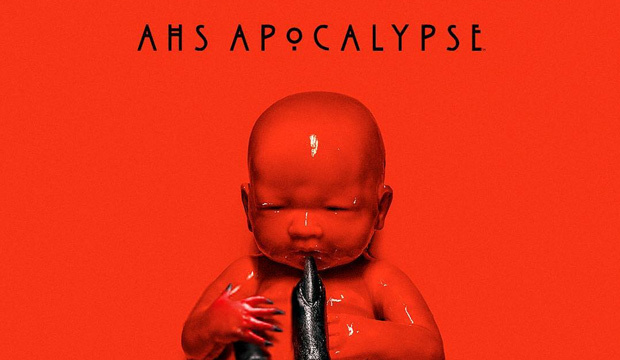 In the official teaser, evil is bred into season 1 character Tate’s (Evan Peters) satanic spawn/demon fetus. So in honour of yet another impressive montage of choreographed cinematic horror, let’s take a look at some of the best teasers that proved to be drastically superior to its dismally dull season. A minimal masterpiece. The impressive herd of witches/school girls marching in complete unison towards a lavish New Orleans mansion, to a haunting cover of ‘House of the Rising Sun’ merely scratches the surface of the extravagant official teaser for ‘Coven’. Just watch the 1 minute 30 clip consecutively for four hours and you would reach the same level of entertainment had you sat through the season as a whole. The bull-human hybrid sprawled across the ivory white patio? Floating, deadly still witches? Genius. The season was a lacklustre exhibit from a promising theme of witchcraft, resting on what seemed like fan-fiction inspired story lines. Like a zombie-boy Evan Peters romance really seemed like a plausible idea. I was shocked to see a carnival-themed season flail like ‘Freakshow’ did. Judging from the trailer alone, the potential for an entertaining carny spectacle was present, but the season became one massively missed opportunity. Overruled by confusing, mismatched sub-plots, and Murphy’s indolent use of ‘shock value’ and killing off every character in some grotesque manner was repetitive and boring. The teaser, however, is a phenomenal feat for a period piece. Lurking in the dimly lit tent is an ensemble of curiosities and side-show attractions, poised and ready for a show. With the drawn curtain and the striped tent set-up, the twisted playground of ‘Freakshow’ reached its height here, again failing to prevail through the season. Lady Gaga as the Countess was a delight on screen. Everything else was not. The first official teaser for the season tracks the hallways of the grim Hotel. Flooded with quirky characters along with a blindingly white room filled with vampire children, the jarring nature of the clip had fans ecstatic. Taking the most mundane aspects of a hotel – a stained hotel mattress, the laundromat, an elevator- and transforming them into a grotesque venture of horror was at first an inventive concept. The season that followed, like ‘Freakshow’, ‘Coven’ and ‘Cult’, was a gratuitous exploration of the hotel rather than focusing on the embodiment of horror I thought it would convey. So, so very wrong I was. I do recommend watching season nine’s trailer. ‘Apocalypse’ is filled with doom, rubble, demons and gas masks, everything you’d want to see from a dystopian-themed season. It’s painfully clear that the show’s producers know what audiences want to see from a teaser, and there is a method at hand of gaining traction and warranting hype. With a theme, comes its symbols. Uniform in their aesthetic and meaning, these underling symbols – whether they be objects or costumes- are utilised in every single one of these trailers. Audiences are instantly attracted to such distinctive imagery with that classic horror twist. So why can’t the entirety of the season follow the same method? Here’s praying that ‘Apocalypse’ will stand out from its abysmal predecessors and won’t follow the pattern of amazing teasers, bad seasons. Do you agree that AHS doesn’t deliver like its teasers do? Let us know in the comments below.